Something to look forward to, with summer on the way. We started off on the wrong foot on the beach. Within minutes we were surprised by no less than three off leash dogs. One after the other they seem to come down from the sand dunes, although I never saw any owner they might have come from. Of course, Viva's stress levels skyrocketed as a result. Viva and Kenzo were still leashed - from April 1 dogs should be leashed on the beaches - although we were looking for a quiet moment to enjoy some off leash play as well as the others, we are no saints either. With the third dog, I had to drop the leash on Kenzo as he or she was very persistent in wanting to meet Viva, who thought that was not a good idea at all. Kenzo send him or her packing. Further down we finally found some more space, and we could enjoy some play and getting our feet wet. Other dogs approached from the horizon, and in an attempt to keep Viva as calm as possible, I retreated with her to the sand dunes, while my wife played some more with Kenzo in the surf. We just sad there, and returned to the surf when the dogs had passed by. Murphy must have traveled with us that day, as most dogs did make an attempt to run up to Viva, even from that long distance. Every time Kenzo followed them, made his point that Viva is off limits, and herded them back to the surf. Kenzo played with them without any problems, no hard feelings. One abducted his ball, and he didn't care. Yet as soon as they ran towards Viva, he drew a line in the sand. One person looked surprised at Kenzo herding the next dog away. "Wow, he really protects her". I thought it was team work. But true, Kenzo's role in keeping Viva safe is so much more then what I could achieve by myself. During the mini-quest to track down Kenzo's ancestors on his father's and his mother's side, I discovered a lot that fascinated me. It all started for the fun of it in the Facebook group Hovawart's family, sharing "old photo's", and in my case, got a little out of hand. Here is what I observed and learned so far, in an attempt to write something down, before this exercise ends in me writing a multiple volume book about Hovawarts and genealogy. After following Kenzo's father's roots, that ended with Markus the Newfoundland, lets have a look at Kenzo's mothers. And as the experts say, holds a lot more genealogical value. Kenzo's mother was Freja, or by her official name, "Sveablik's Freja". She had in all three litters, and Kenzo was part of the first litter. I only have printed photo's of her, and she is not even in the work-dog.eu database, just in the registry of the Danish Kennel Club. Following the direct line from mother to mother we found our "Eve": Dina Geisler, a mix of two farm dogs, also called a "Hofe wart" (old-German for farm guard). 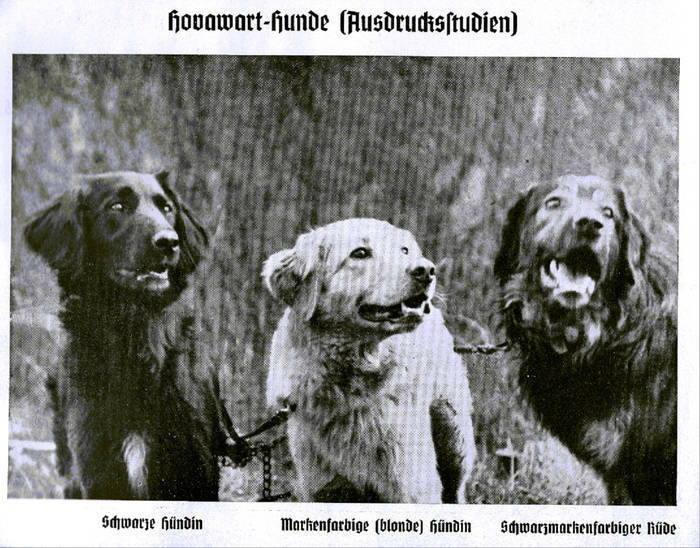 These were dogs the first breeders found on farms, resembling their ideal of a Hovawart. Sparked by Min Inches, we embarked on a small genealogy project of our own to find Kenzo's roots. Together with the registry of the Danish Kennel Club and working-dog.eu, this is what we found out of on Kenzo's father's side. Kenzo's father was "Odin", or by his official name, "Chaccomo vom Bohrertal", and we were so happy to have meet him once. Odin was a Danish champion and he only had one litter. Following the direct line from father to father, we found our "Adam": Markus, a 100% Newfoundland! We ended up scouting the new area we stranded in, Kenzo and me. The car had to get fixed. Again. Thankfully Kenzo was with me, and a walk beats the repair shop's waiting room and bad coffee any day. It was mostly a business park area so I didn't expect to experience any thrilling sights. When you have seen one, you have seen them all. But for Kenzo, a sniff is a sniff. It's good everywhere. Passing a fenced-in area, I got a shock when a dog on the other side of the fence suddenly started barking. They always do that right at the moment you least expect it and when you go around in your own thoughts. Kenzo pretended he didn't noticed the disturbance, continued with his sniffing like nothing happened and only changed his stance to a little more low and calm, while keeping an eye on the other dog only from the corner of his eyes. Excellent, I thought. That was an awesome display of calming dog body language, and gave Kenzo a treat for that. It seemed to have a soothing effect on the "guard" dog, so I threw a treat over to him as well - old habits die hard. He followed us all the way down to the end of the fence. And it was a long fence. He was still barking, but the alarm sound in it was missing. Kenzo remained stoic. On the way back I thought it was better to pass on the other side of the street to avoid all the commotion. No reason to tease the dog after all. This side of the street had a long line of two-feet high boulders along the pavement, and it gave Kenzo plenty of opportunity to do some additional sniffing. Still, the routine repeated itself. When we reached the end of the fence, the dog stopped barking and now he was up for one very rude answer. Like in slow-motion, Kenzo seemed to use every muscle in his body to make himself as tall as possible. His tail went high up into the air, and he took one step to the closest boulder, lifted his leg facing the dog, looked straight at him with his mouth closed, and released some water. The dog answered with a tail wag. I just witnessed Kenzo "giving the Finger" in dog language, and I started laughing out loud, while Kenzo already was parading further down the road, celebrating his "victory". Studying all that dog body language is getting more and more fun, now I have opened my eyes for it. May I jump up on you? Please? This is a post inspired by - and you might like to read that instead - "You Cannot Punish Love". If you are still here, I only want to share why it was an Aha!-moment article for us. We have always been your average "responsible" dog family and learning Kenzo and Viva not to jump up on people was on our shortlist, among others. It didn't totally work out. Actually it is quite easy to train, you just ignore the behavior and they stop jumping. It was working quite fine if I could have resisted those wagging tails and cute smiles when I come in the door. But I can't. I like it when they jump. So I admit. Kenzo is a jumper. It is entirely my fault. I look forward to the ritual that is going to go down as soon as I open the door. I just love to have his paws on my shoulders and get my ear nibbled while he bursts my ear drums with loud barks. Viva is not a jumper, but that is because of her back issues, but she sure bounces. I come down on my knees for her instead so she can make a tiny jump and she loves it too. Luckily for me they first start jumping up on other people after they have already had a couple of earlier good meets with them, so they will not jump up on just anybody right away. But all our regular house guests know, they will probably jump. If they don't like it, they should just ignore it by turning away, I told my guests. I know, it is not my finest hour. Other behaviors, like coming over for a kiss and a hug, while leaving fur and slime on my guests' clothes, I told them to just ignore those advances too if they didn't liked it. Some didn't care, and actually let them jump and had a blast with Kenzo & Viva like I do. Others just did the ignoring by turning away. And then there were the middle-way people. Ignoring the behavior, but making sure they were giving love in some way to Kenzo & Viva, in an other way. Like giving them a belly-rub when they asked for it. In hindsight: they were the smart ones. Kenzo in particular started to develop a non-relationship to the guests that were ignoring him. He even returned to some of the typical behavior we know when he meets people for the very first time: he became suspicious. And that made things worse, as now these guests started to feel he didn't liked them. And in fact, he didn't. Not anymore. "it is the product of an entire evolutionary lineage that survived through cooperation and the building of strong social bonds through reciprocity, trust, play and affection. Thus when a dog is being social with us, it is essential to reciprocate their play and affection." Dogs are complex social beings like us. Probably my biggest mistake was to see it as just another training exercise, without acknowledging what the root cause is that makes them actually jump up in the first place. So it is back to the training of the jumps, and this time in a way to make sure they get the love they are asking for in another way. I imagine my guests now having to perform a mandatory belly-rub or tug-of-war game as soon as they entered the door. At least, if they want Kenzo & Viva to bond with them. I think I never stop learning, dogs are truly fascinating.